Vimeo is a famous video-sharing website in which users can upload, share and view videos. There are many high-definition videos and some nice music videos for watching. It is very convenient if these music videos can be downloaded or converted to MP3 for offline playback on devices. You just need a free Vimeo video downloader or converter – Any Video Converter, which enables you download and convert Vimeo videos to MP3 all in one. Step 2: Go to Vimeo website to copy the video URLs you want to download. 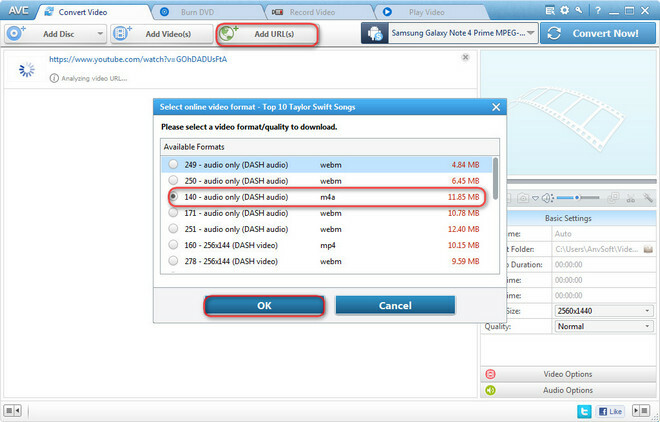 Step 3: Add video URLs to Any Video Converter. Click Download Music Files from the drop-down menu on Add URLs button, then a dialog will pop up, click + icon and paste the Vimeo video URL. Just continue to paste more links as the previous steps. Step 4: Press Start Download! button and click OK to start downloading music files. Tips: You also can press Online Video Tab, then simply choose Manually Select under Select Format thus you can choose the audio format such as MP3, AAC, M4A, M4A, WAV, WMA, etc. you desire when downloading. Step 1: Click Add Video(s) button or drop and drag Vimeo videos to Any Video Converter. Step 2: Click Output Profile and choose MP3 as output format. Unfold Common Audio Formats from the drop-down list and choose a proper format such as mp3, ogg, aac, wav, m4a or wma, then press Convert button to convert Vimeo videos to mp3.